To prepare the beef, roughly chopped the thyme and rub about half of it over the beef with mustard, and salt and pepper. Choose a large roasting pan dish and heat gently on the cook top. Add the oil and when it reaches a high temperature but not too hot, place the beef fillet in the dish and brown on all sides (searing). Wash the leeks very well, and then slice into diagonal chunks about 5cms long. Place them in the casserole dish and toss with the remaining thyme, sliced onion and some garlic. Add the diced potato and braised until cooked. When cooked form a circular cake shape and set on a gratin dish ready to heat – up when require. 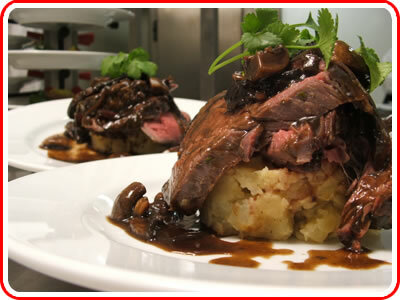 Reduce the beef jus with red wine until the consistency is right (slightly thicker then a pouring cream). Heat the potato back in the oven for 10 minutes (or longer) and bring the sauce to simmering ready to pour. Leave the beef to rest for 5 to 10 minutes before slicing. Set the potato in the middle of the plate; place the rockets over and then sliced the beef fillet on top, pour the sauce over and then around the dish and garnish as per your liking.